Blog Hoppin': This calls for a PAR-TAY!!! Hey guys!! It's Katie, from Little Warriors! Goodness!!! Today I'm another year wiser older! My, how time flies by!!! 36!?!? Wha, wha, whaaaaaat??!?! How does that even happen?? I don't FEEL old, but, when I think about the number, it just doesn't seem quite right. AND, February is a very special month because not only is it MY birthday, but, it's also my blog birthday!!!! Shout out to Erin's Ink for drawing my cake and party hat!!! Ahhhhhhh!!! Little Warriors is turning FIVE this month!!! Can you believe it??? I can't!! But, it's true! HERE is my very FIRST. EVER. post!!!! LOL! So, with birthdays on my brain, I decided to do a little post about birthdays today!! Here are some things that I do for my birthday kiddos! Last Summer I painted my U.G.L.Y., rusted lockers in my classroom with chalkboard paint! I cannot even tell you how much better they look! Especially when someone has a birthday! ;) I decorate their locker with colored chalk! It's so bright and fun and really makes them feel special!! These are the little gifts that I give my Kinders. I found these GEMS at the Dollar Tree last Summer and bought them ALL up!!! They are so fun!! They say "Happy Birthday" across the top AND they light up. PLUS, they have SIX candles on top! I mean, seriously!!! Could they be any more perfect??? And, of course we do a little GoNoodle for our birthday kids!! Here are my two favorites! Want some more AWESOME birthday ideas?? Here are some posts that my Blog Hoppin' Buddies have done in the past! Read about how Erica's Edventures, The First Grade Parade, What the Teacher Wants, Sunny Days in Second, and Mrs. Ehle's Kindergarten Connections celebrate the kiddos in their classrooms!! Since you read all the way to the end on this post, and it's my special day, I have a birthday surprise for you!! I just finished this February pack last night! I think you'll love it!! AND, it's NO PREP centers! But, HURRY!!! 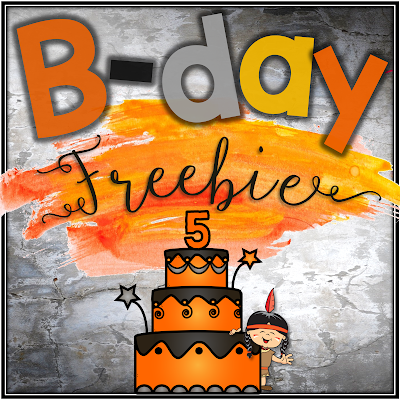 This is a FLASH FREEBIE and it will only be free for 24 hours!!! Just click on the image below to grab yours for FREE today only!!!! P.S. Remember that movie, Groundhog Day??? Good thing that's not real! Or, my birthday would never come!!!! Ha!